QimiQ Whip is available in natural, chocolate and coffee flavour. QimiQ Whip Vanilla is a functional ingredient. 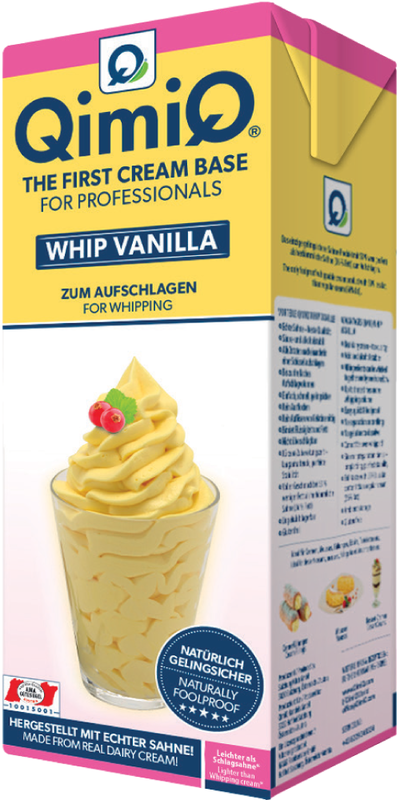 QimiQ Whip Vanilla is used for whipping, for sweet and savoury dishes: eg. mousses, creams, parfaits etc. QimiQ Whip Vanilla can be whipped up to three times of its volume. Use QimiQ Whip Vanilla wherever volume is required. QimiQ Whip Vanilla is best used refrigerated. Lightly whip the cold QimiQ Whip Vanilla until completely smooth and ensure that the entire mixture is incorporated (especially from bottom and sides of bowl). Use QimiQ Whip Vanilla with flavour as a “whip and serve” convenience product – for dessert creams or fillings for eclairs, tartlets etc. QimiQ Whip Vanilla can be stored ambiently unopened for up to 12 months. Once opened, QimiQ Whip Vanilla should be stored in the refrigerator and used within 3-4 days. QimiQ Whip Vanilla consists of cream (18% fat), milk, gelatine and emulsifier (acetic acid esters of mono- and diglycerides of fatty acids).